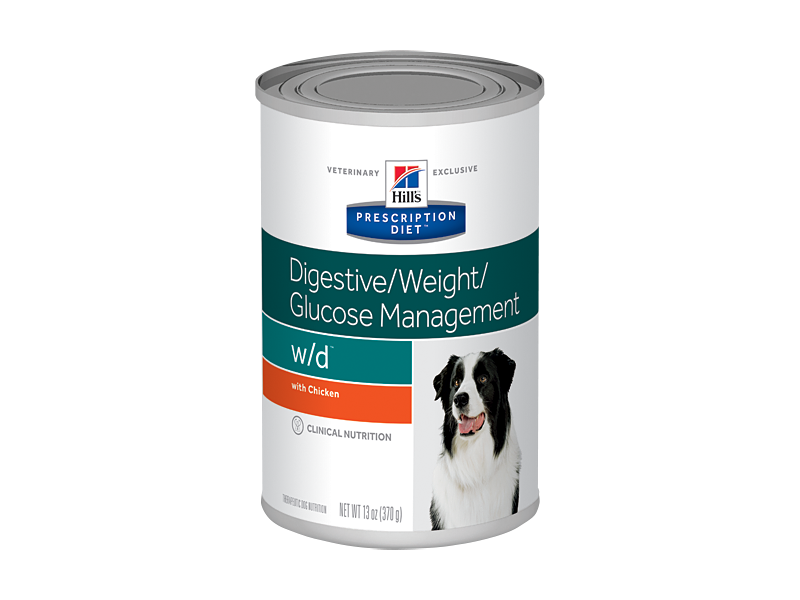 Hill's Prescription Diet Canine w/d is an exclusive formula developed for the nutritional management of dogs prone to gaining weight. Not only does weight gain have implications on a dog's health but it can reduce energy levels as well as the desire to exercise. 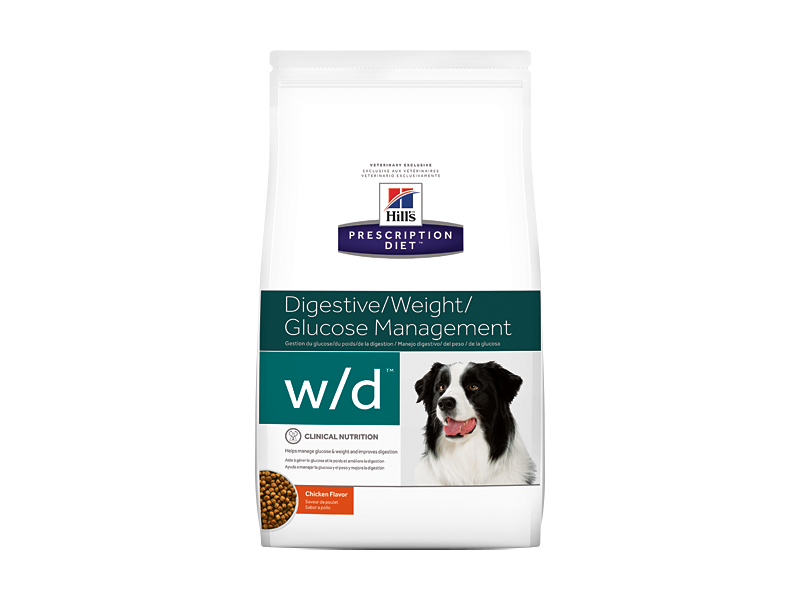 Hill's Prescription Diet Canine w/d has been formulated specifically to help dogs manage their weight, thus avoiding negative health implications and conditions including diabetes, colitis, arthritis and diarrhoea. These ranges are a starting point only, because dogs' needs vary.Adjust the feeding amount to maintain optimal body weight. Fibre Increased total dietary fibre Weight management after weight loss: provides increased dietary bulk which helps reduce satiety and reduce hunger. Diabetes mellitus: helps minimise blood glucose fluctuation, which may help reduce insulin dose. Constipation: helps increase intestinal motility. L-Carnitine Supplemented Facilitates conversion of fat to energy. Helps maintain lean body mass. Protein Reduced Decreases urinary concentration of struvite constituents, magnesium, ammonium (from protein), phosphate. Target urinary pH Acid: pH 6.2 - 6.4 Discourages the formation and aggregation of struvite crystals. Ingredients (Normal dry): Chicken: Chicken (37%) and turkey meal, maize, brewers' rice, animal fat, maize gluten meal, dried whole egg, minerals, digest, dried beet pulp, cellulose, fructo-oligosaccharides, psyllium, vitamins, taurine, trace elements and beta-carotene. With a natural antioxidant (mixed tocopherols). Ingredients (Mini dry): Chicken: Maize, cellulose, chicken (15%) and turkey meal, maize gluten meal, pea bran meal, digest, dried beet pulp, animal fat, flaxseed, minerals, soybean oil, L-carnitine, vitamins, trace elements and beta-carotene. With a natural antioxidant (mixed tocopherols). Prescription Diet™ w/d™ Canine is appropriate for adult dogs that are less active or neutered. Struvite urolithiasis reduction in obesity-prone dogs. There are currently no questions for Hill's Prescription Diet w/d Digestive/Weight/Diabetes Management with Chicken Dog Food - be the first to ask one!